This large countertop acrylic display case comes with two trays. It has two doors with hinges on the outside of the case. The doors have polished handles, but can be replaced if you want to customize the case. The shelves are tilted toward the customer, allowing all items to be easily seen. This large counter bakery case is versatile and can be used to display multiple items. This Counter Bakery Display offers a flawless way to present your items. 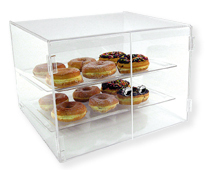 Designed with clear Acrylic, this Countertop Pastry Display, Food Display is a great value. Buy Counter Bakery Display now - Use our convenient shopping cart or give us a call and place your order with a knowledgeable service representative today!